Did you know that your skin is constantly under attack?! We’re talking about free radicals! And they’re everywhere! So how do you go about protecting it? By fighting back with the power of ANTIOXIDANTS!!! First of all, let’s start by answering the big questions: what exactly are free radicals, why are they so bad for our skin, and how do antioxidants combat them? What is a free radical? In science terms, it’s a molecule that is missing an electron, making it unstable, causing an inflammatory response, and resulting in cell damage. The more free radicals we have, the faster our skin ages. They are caused by eating fast food, drinking alcohol, smoking, stress, and even the sun. So if we have these unstable molecules bouncing around in our bodies, causing cell damage, how do they become stabilized? The answer is ANTIOXIDANTS!!! Antioxidants stabilize a free radical by donating an electron to it. In other words, a Free Radical is a bouncing around looking for something to eat. Kind of like a friend that gets ‘hangry’ – they longer they have to wait to eat something, the angrier they get. Once they get some food in their stomach, they’re a happy camper again, and back to being the fun-loving friend you know and love. Antioxidants are like the food that calms down your hangry friend. You’ve witnessed free radicals in action every time you eat an apple or other piece of fruit that turns brown when cut into and exposed to air. The apple turns brown because free radicals attack the exposed cells and start to oxidize them. If you were to apply an antioxidant containing Vitamin C, like lemon juice, to the apple, it would actually prevent it from turning brown. So what can we do to prevent Free Radicals? Obviously, eating a well-balanced diet with antioxidant rich foods are a great start, but we also should be choosing products that contain antioxidants and help us boost our own antioxidant defense as well. 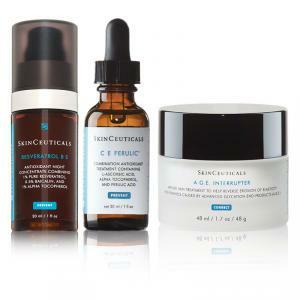 We like to call these 3 SkinCeuticals products the ‘Triple Threat’ because combined, they’re a product powerhouse that will have your skin fighting future Free Radical attacks! Start off your day with their CE Ferulic serum! The key ingredients that make this one of our top picks are L-Ascorbic Acid, Alpha Tocopherol, and Ferulic Acid. This product provides advanced environmental protection against damaging free radicals caused by UV, IRA, and pollution. Then end your day with the Resveratrol B E which contains Resveratrol, Baicalin, and Vitamin E. It will help rebuild your skin’s firmness and density by 18.9%, and also helps to renew skin’s radiance and elasticity! Vitamin C and Vitamin E together PLUS Ferulic Acid work BEST TOGETHER for environmental protection. CE Ferulic in the morning and Resveratrol BE in the evening. The third product we couldn’t be without is the AOX + Eye Gel, which contains Phloretin, L-Ascorbic Acid, Ferulic Acid, and Ruscus Aculeatus Caffeine. This is used both morning and evening to help fight signs of aging, visably improve signs of photodamage, and help reduce the appearance of puffiness and under-eye bags to restore a fresh, vibrant appearance. Using these Triple Threat products together will have your skin showing signs of improvement in just 12 short weeks! Great products take time for results to show because they work on a deeper level and continued use will enhance the benefits.